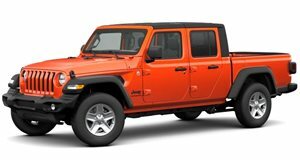 Thanks to the folks at Jeep Gladiator Forum, we can bring you these photos of the first 2020 Jeep Gladiator to roll off the production line at the Toledo, Ohio factory. The Gladiator in question is a Rubicon model painted Billet Silver equipped with the Trail Rail system, a tonneau cover for the bed, and all-terrain tires. That’s a good sign for potential buyers who want to add those accessories and plenty more. Not all automakers have these accessories ready to go at launch. We don’t have a breakdown as to how many Gladiators are being built on spec or to order by anxious customers, but there’s no question Jeep has yet another smashing sales success on its hands. Unveiled last November at the LA Auto Show, the 2020 Jeep Gladiator is the long-awaited pickup truck the off-road-focused brand has been promising for years. Fiat Chrysler had to shift some production at the Toledo factory in order to not only accommodate the Gladiator but also expected high demand for the regular Wrangler two- and four-door models as well. The Jeep Cherokee is now being built in Belvidere, Illinois. It wasn’t a bad problem to have. The new Gladiator comes standard with the familiar 3.6-liter Pentastar V6 gasoline engine, which delivers 285 hp and 260 lb-ft of torque. It is linked to either a six-speed manual or an optional eight-speed automatic transmission. For the 2020 model year, Jeep intends to offer a 3.0-liter V6 diesel option, producing 260 hp and 442 lb-ft of torque, though it’ll be offered only with the slushbox. Two 4x4 systems are available: the Command-Trac, which comes standard on Sport and Overland trims, or the aforementioned Trail Rail system on Rubicon models. Obviously the preferred choice for more serious off-road buyers, the Gladiator Rubicon also boasts an improved total suspension with an electronic sway-bar disconnect. Another huge plus for the Gladiator: it has best-in-class towing with 7,650 pounds and a 1,600-pound 4x4 payload capacity. Expect to see Gladiators hitting the roads (and trails) in the very near future.